The local body elections 2016 have provisional results for the Mayor, with Sandra Goudie (5584 votes) and Peter French (5103). 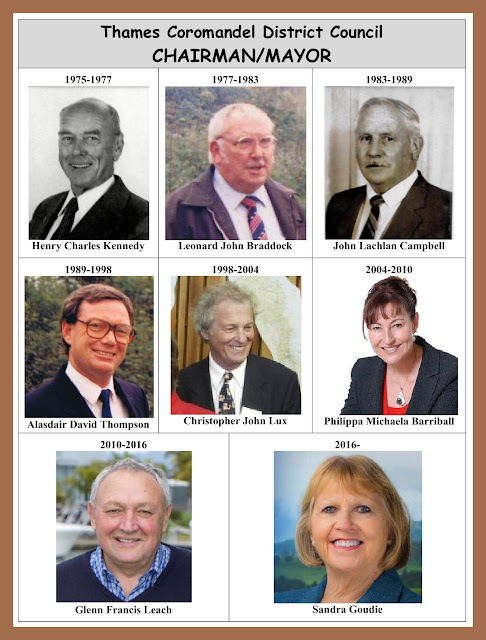 The names of the past Chairman/Mayor of the Thames Coromandel District Council are: 1975-1977 Henry Charles KENNEDY; 1977-1983 Leonard John BRADDOCK; 1983-1989 John Lachlan CAMPBELL; 1989-1998 Alasdair David THOMPSON; 1998-2004 Christopher John LUX; 2004-2010 Philippa Michaela BARRIBALL; 2010-2016 Glenn Francis LEACH; and 2016- Sandra GOUDIE. Thames (NZ): FULLER'S EARTH mining at Tararu.